Sinai Peninsula, with the Gulf of Aqaba (right) and the Gulf of Suez (left), as viewed from the Space Shuttle STS-40. The Gulf of Aqaba (Arabic: خليج العقبة; transliterated: Khalyj al-'Aqabah), in Israel known as the Gulf of Eilat (Hebrew: מפרץ אילת, transliterated: Mifratz Eilat) is a large gulf of the Red Sea. It is located to the east of the Sinai peninsula and west of the Arabian peninsula. Egypt, Israel, Jordan, and Saudi Arabia all have coastlines on the Gulf of Aqaba. The Gulf serves as a connecting point for the African and Asian continents. Prior to the 1994 Peace Accords between Jordan and Israel, there was little development in the Gulf's region due to historical long-standing violence. Knowledge of the Gulf’s physical, chemical, and biological processes was fragmentary until the agreement brought relative stability to the region. Since that time there has been massive commercial and industrial development, which weighs heavily on the its marine environment. The Gulf of Aqaba's logistical importance and its environmental concerns have required long-standing enemies to work together. Commitment to preserve and protect the region's fragile environment has resulted in cooperation not only between those who signed the peace treaty, but between all its border nations. 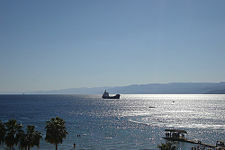 The Gulf of Aqaba, like the coastal waters of the Red Sea, is one of the world's premier diving locations. The area is especially rich in coral and other marine biodiversity. It also contains a number of underwater wrecks, some accidental shipwrecks, others vessels deliberately sunk in an effort to provide a habitat for marine organisms and bolster the local dive tourism industry. The Gulf of Aqaba is one of two gulfs created by the Sinai Peninsula's bifurcation of the northern Red Sea; the Gulf of Suez lying to the west of the Sinai Peninsula and the Gulf of Aqaba lying to its east. It varies in width from 12 to 17 miles (19 to 27 km) and is 110 miles (177 km) long. Geologically, the Gulf of Aqaba is an integral part of the Great Rift Valley, a geographical and geological feature running north to south for around 4000 miles (6,400 km), from northern Syria to central Mozambique in East Africa. Created by seismic activity along the Afro-Syrian Rift, it is a deep narrow body of water, which astronauts say is the most significant physical detail on the planet that is visible from space. The Gulf of Aqaba stretches north from the Straits of Tiran to a point where the border of Israel meets the borders of Egypt and Jordan. At this northern end of the Gulf are three important cities: Taba in Egypt, Eilat in Israel, and Aqaba in Jordan. All three cities serve both as strategically important commercial ports and as popular resort destinations for tourists seeking to enjoy the warm climate of the region. Further south, Haql is the largest Saudi Arabian city on the gulf. On Sinai, Sharm el-Sheikh and Dahab are the major centers. This semi-enclosed sea has unique natural features, the foremost of which is its coral reef ecosystem, one of the northernmost and most diverse in the world. 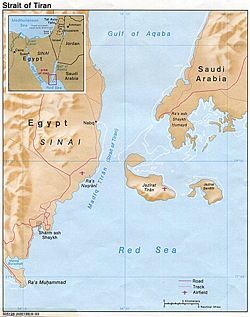 Map of the Sinai Peninsula, with the Gulf of Aqaba on its east. Map of Red Sea showing Gulf of Aqaba at its northern end. 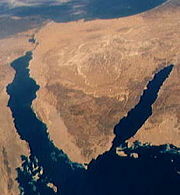 Northern section of the Great Rift Valley: the Sinai Peninsula is in the center and the Dead Sea and Jordan River valley are above. The Straits of Tiran (Arabic: مضيق تيران, Hebrew: מיצרי טיראן), are the narrow sea passages, about 8 miles (13 km) wide, between the Sinai and Arabian peninsulas which separates the Gulf of Aqaba from the Red Sea. It is named after Tiran Island located at its inflow, on which the Multinational Force and Observers has an observation post to monitor the compliance of Egypt in maintaining freedom of navigation of the straits as provided under the Israel-Egypt Peace Treaty. Access to Jordan's only seaport of Aqaba and to Israel's only Indian Ocean seaport of Eilat is contingent upon passage through the Gulf of Aqaba, giving the Straits of Tiran strategic importance. Egypt's blockade of the Straits to Israeli ships and ships bound for Israel in 1956 and again in 1967 was a catalyst to the Suez Crisis in 1956 and the Six-Day War in 1967.
International documents inconsistently refer to both the "Straits of Tiran" and the "Strait of Tiran." There are several passages formed by the islands between Egypt and Saudi Arabia. The westernmost strait, between Egypt and the island of Tiran, overlooked by the Egyptian city Sharm el-Sheikh is the "Strait of Tiran." It has two passages deep enough to be navigable by large ships. The Enterprise passage, 950 feet (290 m) deep, is right next to the Egyptian side, while the 240-foot-deep Grafton passage, surrounded by shallows, is to the east, nearer to the island of Tiran. To the east of Tiran, between it and Saudi Arabia, the other strait has reefs and shallows with a single channel 54 feet (16 m) deep. A project to build a 9.3-mile (15.0 km) bridge across the straits, linking Egypt and Saudi Arabia, is under consideration by the Egyptian government. A bridge at this point would bypass Israel, which physically stands between the Arab lands of Africa and the Arab lands of Southwest Asia. The Gulf of Aqaba is a semi-enclosed sea, resulting in the evolution of unique biological diversity, with numerous endemic species both in its fish life and coral reef conmmunities. Development of the region has adversely affected the gulf and the Red Sea, to which it is connected. As a result of its semi-enclosed nature, the Gulf of Aqaba is particularly susceptible to marine pollution and ecosystem degradation. Until the 1960s, the coastline of the Gulf of Aqaba was only sparsely populated by Bedouins and relatively unaffected by development. 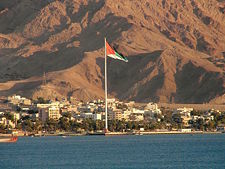 Since the 1994 Peace Accords between Jordan and Israel, there has been massive commercial and industrial development; including the creation of a commercial harbor, pleasure boat marinas, a naval base, an oil terminal, a dolphinarium, a research laboratory, an underwater observatory, a protected coral reef nature reserve, and numerous hotels, restaurants and other tourist activities. These developments have seriously disturbed the Gulf's coastal and marine ecosystems. Thermal industrial pollution, sewage discharges, frequent small to moderate oil spills, and phosphate deposition from ship loading operations have severely eroded coral life, particularly in the Gulf's intensively developed northern reaches. Poorly regulated resort development and over-fishing have also caused environmental devastation. The cities of Taba in Egypt, Eilat in Israel, and Aqaba in Jordan are the three major cities located on the Gulf of Aqaba. Taba is a small Egyptian town near the northern tip of the Gulf of Aqaba and is Egypt's busiest border crossing with neighboring Israel. Taba was on the Egyptian side of the armistice line agreed to in 1949, and returned to Egypt when Israel withdrew from the Sinai in 1957. When Israel reoccupied the Sinai after the Six-Day War (1967), a 400-room hotel was built at Taba. 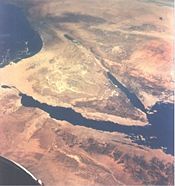 When Egypt and Israel were negotiating the exact position of the border in preparation for the 1979 peace treaty, Israel claimed that Taba had been on the Ottoman side of a border agreed between the Ottomans and British Egypt in 1906 and had, therefore, been in error in its two previous agreements. After a long dispute, the issue was submitted to an international commission composed of one Israeli, one Egyptian, and three outsiders. In 1988, the commission ruled in Egypt's favor, and Israel returned Taba to Egypt later that year. 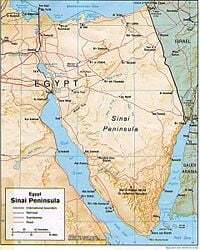 It was the last portion of Sinai to be returned to Egypt under the terms of the 1979 Israel-Egypt Peace Treaty. The town is the northernmost resort of Egypt's Red Sea Riviera. The modern city of Eilat was founded in 1951, though there is archeological evidence of habitation in the region as far back as 8000 B.C.E. Eilat is mentioned several times in the Bible, first as one of the stations of the Children of Israel after The Exodus from Egypt. During the Roman period a road was built to link the area with the Nabataean city of Petra. The area of Eilat was designated as part of the Jewish state in the 1947 UN Partition Plan. After the 1948 Arab-Israeli War Arab nations maintained a state of hostility with Israel, blocking all land routes; Israel's access to and trade with the rest of the world was maintained by air and sea alone. Further, Egypt denied passage through the Suez Canal to Israeli-registered ships or to any ship carrying cargo to or from Israeli ports. This made Eilat and its sea port crucial to Israel's communications, commerce and trade with Africa and Asia, and for oil imports. Without recourse to a port on the Red Sea Israel would have been unable to develop its diplomatic, cultural and trade ties beyond the Mediterranean basin and Europe. Today tourism is the city's major source of income. 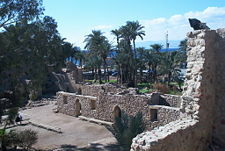 Aqaba has been an inhabited settlement since 4000 B.C.E. profiting from its strategic location at the junction of trading routes between Asia, Africa, and Europe. The early settlement was presumably Edomite in ancient times. It was a center of the Edomites, and then of the Arab Nabataeans, who populated the region extensively. During World War I, the occupying Ottoman forces were forced to withdraw from the town after a raid led by T. E. Lawrence and the Arab forces of Sharif Hussein in 1917, making the territory part of the Kingdom of Hejaz, under the rule of Prince Faisal. The capture of Aqaba helped open supply lines from Egypt up to Arab and British forces afield further north in Transjordan and Greater Palestine, and more importantly alleviated a threat of a Turkish offensive onto the strategically important Suez Canal. In 1965, King Hussein attempted to give Aqaba room to grow by trading land with Saudi Arabia. In return for 2,317 square miles (6,000 sq km) of desertland in Jordan's interior, the Saudis traded 7.5 miles (12 km) of prime coastline to the south of Aqaba. In addition to the extra land for expansion of the port, the swap also gave the country access to the magnificent Yamanieh coral reef. The town is best known today as a diving and beach resort. However, industrial activity remains important to the area, and the town is an exporter of phosphate and some shells. The town is also an important administrative center within the far south of Jordan. 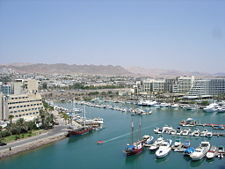 The "Israel-Jordan Agreement on Eilat-Aqaba Special Area" was signed in 1996. It is an agreement between the two nations to cooperate on issues impacting the towns of Eilat and Aqaba, such as: environmental management, pest control; flood management; town zoning and land use policies; energy and natural resources; emergency response services; and the promotion of binational and multinational events, such as music festivals, sporting events. It also provides for joint research and development in marine culture, tourism, and ease of border crossings. "Taba-Eilat-Aqaba Macro Area Working Group," also known as "TEAM," is a program which involves the three nations of Israel, Jordan and Egypt for the purpose of coordinated development of the gulf area involving its three major cities. While each nation is responsible for its own gulf city, TEAM focuses on strengthening infrastructure links and coordinating environmental protection, as well as economic development. ↑ Carl F. Salans, 1968. "Gulf of Aqaba and Strait of Tiran: Troubled Waters." United States Naval Institute Proceedings Magazine 94 (56). ↑ Najla Moussa. March 2, 2006, Bridge connecting Egypt, Saudi Arabia considered Daily News Egypt. Retrieved October 31, 2008. ↑ Global Environment Facility. May 1996. Gulf of Aqaba Environmental Action Plan Retrieved November 1, 2008. ↑ The American-Israeli Cooperative Enterprise. The Gulf of Aqaba Retrieved November 1, 2008. Israel Ministry of Foreign Affairs. September 30, 1997. Gulf of Aqaba- Environment Retrieved May 16, 2008. Jewish Virtual Library. The Gulf of Aqaba Retrieved May 16, 2008. Obeidi, Tarik. Aqaba, Trade and Environment American University. Retrieved November 2, 2008. Oren, Michael B. 2002. Six days of war: June 1967 and the making of the modern Middle East. Oxford: Oxford University Press. ISBN 9780195151749. Salans, Carl F. 1968, "Gulf of Aqaba and Strait of Tiran: Troubled Waters." United States Naval Institute Proceedings Magazine 94 (56). 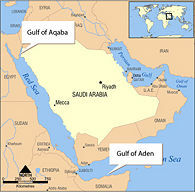 History of "Gulf of Aqaba"
This page was last modified on 24 November 2008, at 11:48.